Beautiful RARE Hign Denomination registered certificate from the Fourth Liberty Loan 4 1/4% Gold Bond of 1933-1938 issued in 1918. Gold underprint "FOURTH LIBERTY LOAN". Gold treasury seal. Abraham Lincoln. Facsimile signatures of Teehee and McAdoo. $1000 denominations are extremenly rare since most of them were cashed in due to their large face value. 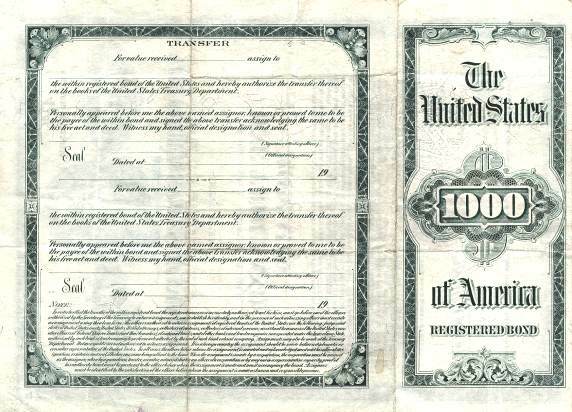 This is only the second time we have seen a $1000 Liberty Loan Bond. Jul 28, 1914 World War I begins with Austria-Hungary's declaration of war against Serbia. Jul 31, 1914 New York Stock Exchange closes because of European Crisis. (Reopens Dec. 12). Aug 1914 Emergency currency is issued under Aldrich Vreeland Act. Aug 1, 1914 German declares war on Russia (France on Aug. 3, Britain on Aug. 4). Austria-Hungary declares war on Russia and Japan declares war on Germany in August. Nov 16, 1914 Federal Reserve Banks open for business. Jan 25, 1915 Telephone service begins between New York and San Francisco. Oct 15, 1915 U.S. bankers float $500 million loan to Britain and France at 5 percent. Sep 8, 1916 Emergency Revenue Act doubles income tax rates, adds estate tax and munitions profits tax, and establishes Tariff Commission. Nov 7, 1916 Wilson is reelected as President. Feb 3, 1917 USS "Housatonic" is sunk by German submarine, and U.S. breaks diplomatic relations with Germany. Mar 3, 1917 Special Preparedness Fund Act provides for excess profit taxes and higher inheritance taxes. Apr 24, 1917 Emergency Loan Act authorizes issue of $5 billion in bonds at 3.5 percent. Jun 21, 1917 Federal Reserve Act is amended to encourage membership, mobilize gold reserves, and facilitate issue of notes. Oct 1, 1917 Second Liberty Loan offers $3 billion in bonds at 4 percent. Oct 3, 1917 War Revenue Act doubles income taxes, provides for excess profits tax, and imposes many excises. Nov 6, 1917 Russian Bolshevist overthrow Kerensky's Provisional Government, placing Lenin in power. Dec 7, 1917 U.S. declares war on Austria-Hungary. Dec 26, 1917 The U.S. Railroad Administration takes charge of the nation's railroads. Apr 5, 1918 Third Liberty Loan offers $3 billion in bonds at 4.5 percent. Sep 28, 1918 Fourth Liberty Loan offers $6 billion in bonds at 4.25 percent. History from OldCompany.com (old stock certificate research service).